“Bonobos: Unique in Mind, Brain, and Behavior”, the book on bonobo research by Associate Professor Shinya Yamamoto of KUIAS has just been published from Oxford University Press. Along with the chimpanzee, the bonobo is one of our two closest living relatives, but still, they are unique and different from chimpanzees. However, their relatively narrow geographic range, combined with the political instability of that region, has made their scientific study extremely difficult. 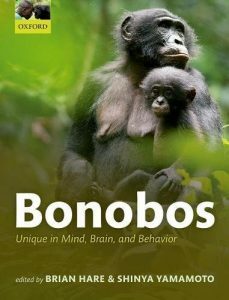 This book is a collection of latest empirical research revealing exactly how unique bonobos are in their mind, behavior and society, and has proved the tremendous value of bonobo studies for investigation of hominid evolution. This reminds us why it is so important that we redouble our efforts to protect the few remaining wild populations of this iconic and highly endangered great ape species.